On a Saturday morning in January, Seattle Pacific University Minister of Discipleship Matthew Koenig watched as young people clad in greenhooded capes made their way into Upper Gwinn Commons to claim seats — several hours before the scheduled speaker even arrived at the podium. or, more accurately, the allure of J.R.R. Tolkien’s The Lord of the Rings. Koenig first journeyed through Middleearth only recently. As so many readers have experienced since the first publication of “the book of the century” in 1953, he was challenged and captivated by Tolkien’s imagination, voice and resonant Christian themes. Moreover, he was inspired. Koenig joined with Bryan Cole in the Office of Student Programs to create The Lord of the Rings Film and Lecture Event, a campus festival coinciding with the theatrical run of the third film in director Peter Jackson’s adaptation of the trilogy. 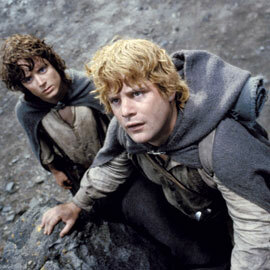 On January 15 and 17, New Line Cinema’s “The Fellowship of the Ring” and “The Two Towers” played on SPU screens. One of the film’s beloved stars — Rhys-Davies (Gimli) — made a guest appearance. Seminars hosted by faculty, staff and guests covered a variety of perspectives on the saga. For a finale, Koenig arranged for almost 100 students to attend a Saturday evening screening of “The Return of the King” at Seattle’s famous Cinerama theater. While Koenig has not yet gone so far as to don hobbit garb like some enthusiastic students, he does find Middle-earth to be a rewarding context in which to consider the challenges of following Christ into places unknown. The sacrificial departure of Frodo the hobbit from his idyllic home in the Shire and the desperate quest he undertakes to destroy the One Ring — Middle-earth’s weapon of mass destruction — suggest the story of a savior who bore a cross in order to save the world. Similarly, the tale of Aragorn, a man wrestling with the responsibility of accepting his destiny as king, suggests to Koenig the way people must wrestle with their own self-doubts in order to embrace God’s call. Koenig’s vision proved contagious. Tolkien experts and enthusiasts from on and off campus volunteered to lead students in exploring various corners of Middle-earth. Christie Eppler, assistant professor of counselor education, explored the resiliency of Frodo in her presentation, “To Journey On When All Seems Lost.” Other seminar topics included “I Fear a Cage: Courage and Calling for Women in The Lord of the Rings,” presented by Laurie Wheeler, associate pastor of Seattle’s Church at the Center; and “Tragedy and Triumph in The Lord of the Rings,” led by Gregory Wolfe, editor of Image: A Journal of the Arts and Religion. For many, a visit from Rhys-Davies — who participated in all three installments of Peter Jackson’s film trilogy as both the temperamental, axe-wielding dwarf named Gimli and as the voice of Treebeard — proved the highlight of the Seattle Pacific event. As Gimli, this 60-year-old veteran of stage and screen was made unrecognizable beneath layers of makeup and a bristling red moustache and beard that required several hours of application daily. (Don’t let the movies fool you: He’s actually taller than the actors who played Gandalf, Aragorn and Legolas.) Nevertheless, students quickly recognized him as Sallah, Indiana Jones’ boisterous and beloved sidekick. things are sort of OK, and then they go bad, and then they get worse, and then they seem to get a little bit worse, then something really bad happens, and then there’s a fight, and things look really bad, and there’s another battle, and then things look really, really bad.” He explained that, to combat the constantly escalating tension, the screenwriters made Gimli a “lightning rod” of comic relief. The ongoing enthusiasm for Tolkien’s work — which was definitely in evidence at SPU’s January event — begs the question: What makes his achievement so powerful? Editor’s Note: Response writer Jeffrey Overstreet, also a film columnist with Christianity Today, taught one of the seminars at The Lord of the Rings Film and Lecture Event. Students in his session listened to excerpts from interviews in which film cast and crew members offer their own interpretations of the story. Edited transcripts are now available from this issue's home page.